Perlis was originally a state within a state, tucked away in the northern reaches of Kedah. Siam subsequently cleaved it off and made it a vassal of Bangkok. Although its fortunes have often been at the mercy of larger powers, the name of Perlis has spread far and wide because of its famous Harum Manis mangoes, which are sought through online orders before they are ripe. Najib Razak even promoted the mango to the Emperor of Japan. Tuanku Sir Syed Harun Putra ibni Al-marhum Syed Hassan Jamalullail (1920–2000), Raja of Perlis. 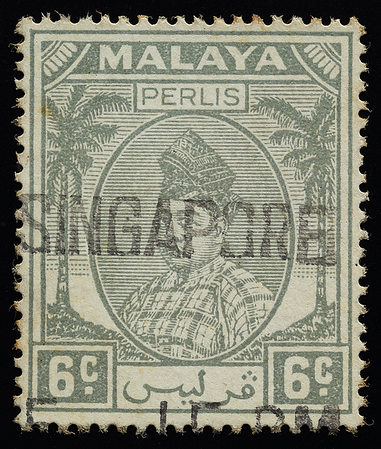 The Perlis issue is yet another delightful variation on the coconut design, with English state name inserted above the medallion. 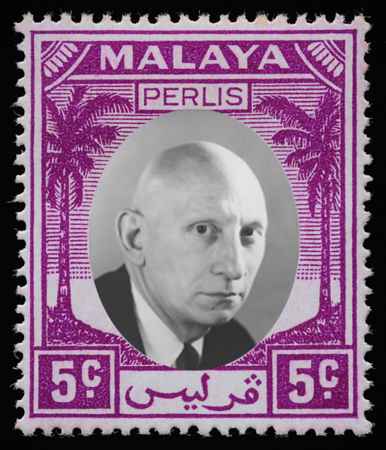 In the Crown Agents, Philatelic and Security Printing Archive exists an unapproved die proof in which there appears a bead at the tip of the Raja's tengkolok, making him look somewhat like Santa Claus. It is not widely known that the head of Malaya's smallest and most remote state was also Singapore’s last king. Syed Putra was Yang di-Pertuan Agong (king) of Malaysia when Singapore separated and became a sovereign state in 1965. He opened the iconic "pineapple-skinned" parliament complex in Kuala Lumpur where the first parliament of Malaysia—including Singapore, Sarawak and Sabah—met in 1963. He was still in office when the author first visited Perlis as a child in the 1990s. 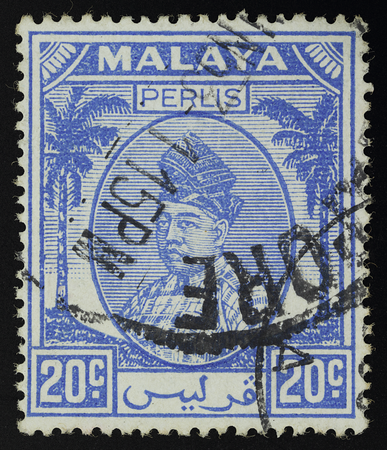 It is not inconceivable that the sultan could have opted to be seen in simple clothing on the stamp, given his humble disposition. During the Japanese occupation he lived in a hut near Arau railway station, and sold cakes and sundry goods for a living in Kelantan in 1945. As head of state, Syed Putra tended to dispense with formalities and protocol, said his first wife Tengku Budriah Almarhum Tengku Ismail. In 1952 he married Riam Pessayanavin, who had been crowned Miss Siam in 1939. 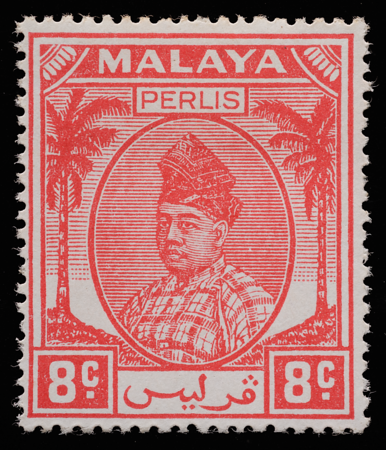 Stamps from the northernmost state of Malaya used in Singapore, the southernmost state. The circular date stamp titillates the senses with its typographical incompleteness bounded by the architectural completeness of the coconut definitive. Then there was Alan Perlis, the American computer scientist who won the Turing Award and bequeathed a long list of wise sayings inspired by programming, known as Perlisisms.